You've seen "March of Progress," the famous illustration depicting the parade of modern man's evolutionary predecessors, from apes to Cro-Magnon. If for no other reason, it's famous as the setup for a thousand visual gags. As a gamer, the one you've probably seen most ends with modern man devolving back into a hunched-over Neanderthal typing furiously on some internet forum. There's also the one where the fully evolved guy bellies up, after uncounted millennia, to a coin-op arcade machine as though that's what lured him out of the primordial goo in the first place. Like chimps have become people, games have also evolved. Not that the analogy - or the graphic - is perfect. As you read about "March of Progress," you learn it wasn't meant to communicate the idea of inexorable, one-way development that slowly replaces the primitive with the more evolved until Homo sapiens is replaced by Homo futurificus with a head the size of a watermelon and godlike psionic powers. Evolution is more accurately thought of as a branching tree with dead ends and parallel development of related species. But whatever you think about Scopes, the Flying Spaghetti Monster and all the brouhaha between them, there's no question that games have evolved from the decisions of intelligent designers. 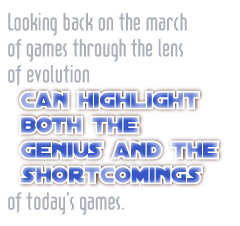 Looking back on the march of games through the lens of evolution can highlight both the genius and the shortcomings of today's games. For these purposes, let's split out two main evolutionary branches of gaming. On one branch, we have games that primarily involve the manipulation of playing pieces in relation to each other. Call them "competitive games." The monkey in this picture is the ancient game Senet, or maybe the Royal Game of Ur. Modern man probably looks something like Dawn of War II. These are games that one player wins decisively by trapping stones (Go), capturing kings (chess) or blowing up the enemy's HQ (take your pick, Commander RTS). Victory conditions exist even for the versions of these games that are played solo. On the other branch, there's a strain of games that's developed much more recently in evolutionary terms. Roleplaying games are less about the manipulation of playing pieces on a physical or virtual board and more about the changes brought about and experienced by players as they negotiate a game world with verisimilitude. This avatar-centric, non-competitive gaming subspecies is a bit harder to see in the uni-browed predecessors of the modern RPG than today's bleeding-edge games. The modern roleplaying game grew out of the older, more competitive style at some point between H.G. Wells' Little Wars, which many consider to be the first modern tabletop war game, and Jeff Perren and Gary Gygax's Chainmail, the precursor to Dungeons & Dragons. While roleplaying became its own concrete genre with D&D, its players still carried out a lot of the action by moving painted lead figures around on dry-erase battlemats and felt like they had won when they killed the level boss. A lot of people still play D&D that way today.